Carrie Pilby (Bel Powley) is a 19-year old genius, a year out of Harvard, four years ahead of her peers, living in New York City. Burdened with an overactive moral compass and self-consciously aware of her uncommon intellect, in a city full of people she considers oversexed, deceitful hypocrites, Carrie finds herself isolated, friendless, dateless and unemployed. As she tackles each item on the list, Carrie begins to make new friends: Tara (Vanessa Bayer) and Doug (Desmin Borges) at the law office where she works the graveyard shift proofreading legal briefs in a job reluctantly arranged by her dad; Cy (William Moseley), her didgeridoo-playing neighbor who, like Carrie, is also a prodigy; and the confused, engaged Matt (Jason Ritter), who thinks he might find clarity about his pending nuptials in the arms of another woman. As Carrie gets to know them, she learns that they are not one-dimensional stereotypes but living, breathing, complex human beings. Carrie begins to understand that humans, like books, can’t be judged by their “covers”. Set against the backdrop of decked-out-for-the-holidays New York City, Carrie evolves into the compassionate person she never knew she wanted to be. “Carrie Pilby” is based on American author Caren Lissner’s novel of the same title and first published by Harlequin Enterprises’ Red Dress Ink in 2003. The book was among the first novels published by the imprint created to take advantage of the then-burgeoning “chick lit” phenomenon that included humorous books about young, single women like “Bridget Jones’ Diary”. 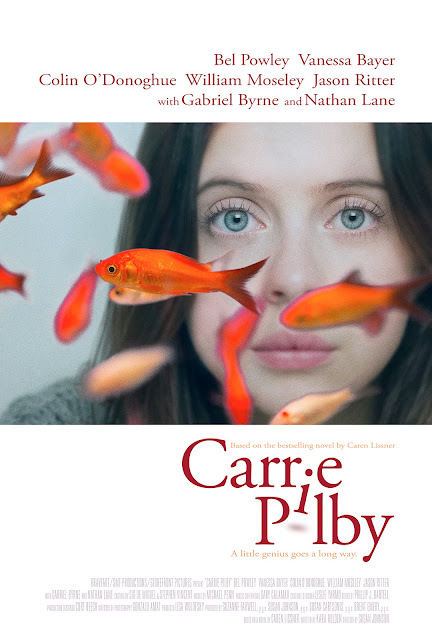 “Carrie Pilby” was noted in several reviews as one of the smarter and more original novels in the genre, with Neil Genzlinger of The New York Times labeling it "hilarious". It proved successful, selling more than 50,000 copies. After the chick lit market became saturated, Harlequin stopped publishing novels under the Red Dress Ink imprint in 2009 but selected “Carrie Pilby” to be re-published in 2010 as one of the first books in the new Harlequin Teen line. The title has continued to grow internationally every year since 2010 and is now available in France (2nd printing), Germany, Spain, Argentina, Mexico, Australia, Poland, Indonesia, Italy and the UK. “I could tell right away the women involved, the director Susan Johnson and the producers, were so passionate and had so many great ideas” said author Caren Lissner. “Susan was very inclusive. She really allowed me to see into the process, and to read every draft and offer notes,” Lissner says. “Carrie Pilby” will open March 29 in cinemas from Pioneer Films.